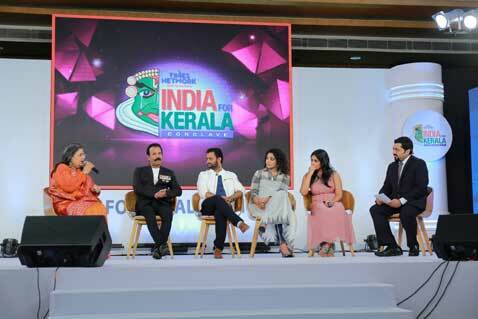 Thiruvananthapuram: Times Network, part of India’s largest media conglomerate, The Times Group, hosted the ‘India for Kerala Conclave’ at Taj Vivanta, Thiruvananthapuram yesterday. Focused on rebuilding and rehabilitating the State with a new vision, the conclave is an on-ground extension of the #IndiaforKerala campaign initiated by the Network. Inaugurated in the presence of H. E. Shri P. Sathasivam, Hon’ble Governor of Kerala, the Conclave was addressed by key decision and policy makers including Mr. Thomas Isaac, Finance Minister, Kerala, Mr. Shashi Tharoor, Member of Parliament, Lok Sabha amongst others. The Conclave also exhibited support for Kerala from various sectors including Government, Corporates and Mollywood. Kerala has faced the worst calamity in over a century and the devastation is unprecedented. Rebuilding Kerala has to be a national priority, given the scale of the disaster. The State’s importance as a major tourism destination and its crucial role as a remittances hub and international links makes the action highly visible at the Global level and therefore a great branding opportunity for India to showcase its resilience and indomitable national spirit. The Conclave witnessed interactive sessions with eminent panellists from the political and corporate world deliberating the best possible ways to help the state and its people. There were some thought provoking discussions in sessions that included topics like ‘Rebuilding Kerala – What Will It Take’, ‘Kerala Economy Recast – Aid or Self Reliance’, ‘Citizens for Kerala’, ‘Social Media Impact: Help & Hindrance’ and ‘Reimagining Kerala’. Dignitaries like Mr. Shibu Baby John – RSP Leader, Mr. MK Muneer – IUML Leader, Mr. V Muralidharan – MP – BJP, Mr. Prashant Nair – IAS, Mr. Oomen V Oomen – former Chairman of Kerala Biodiversity Board, Mr. Harish Vasudevan – environmental lawyer, Mr. Rahul Easwar – author & activist, Padma Shri G Shankar – Architect, Mr. Jose Dominic – CEO, CGH Earth, Mr. George Lamannil – Executive Director and General Counsel, Muthoot Group, Mr. Salim Yusuf – South Head Taj Hotels, Mr. Jose Joseph – Executive Vice President at Federal Bank, and well-known personalities from the entertainment industry like Resul Pookutty, Rima Kallingal, Samyukta Menon, Major Ravi, Usha Uthup expressed their views to come together to partner with the people of Kerala to rehabilitate and rebuild the lives of those devastated by rain and flood. As the citizens of Kerala came together to help each other selflessly, the India for Kerala Conclave also acknowledged the local heroes contribution and efforts. The local heroes felicitated included Air Marshal Suresh-Air Officer Commanding-in-Chief of Southern Air Command, Maj Gen Sanjeev Narain-General Officer Commanding- Karnataka and Kerala Sub Area, Silvadasan Antony-Coastal Warrior, Vijay Sakhare-IPS-IG Ernakulum Range, Rajamanickam-IAS-Commissioner Food Safety along with actor Tovino Thomas. H. E. Shri P. Sathasivam, Hon’ble Governor of Kerala said, “The floods may have rendered us weak for a while, but, our resolve was to strive and not to yield. The floods have left with many lives lost and destruction to properties. Farming sector has been washed away and the many developmental initiatives were rendered to a halt. We estimate around Rs.10,000 crore to rebuild our damaged roads and bridges. The Honourable Prime Minister had clarified to me that the Rs.600 crore released by the Centre in addition to the Rs.562.45 crore already made available in the State Disaster Response Fund of Kerala, was only the advance aid and that additional funds will be released from National Disaster Response Fund as per laid down procedure. Today, the entire world stands with us and help is pouring in to Kerala, not just from our own people, but from other governments, corporates, workers, entrepreneurs, religious institutions, media houses, celebrities and even from the piggy-banks of our little children from around the country. We are extremely grateful to all and let me assure the world that we will prove worthy of your trust by rebuilding a Kerala that the world would admire. Mr. T. M. Thomas Isaac, Finance Minister, Kerala, said, “The recent floods have created a frank open discussion in rethinking of the past developments and what could be done jointly in the present. We are thinking about a new edition of ‘Kerala Model’ of development. In our old edition, we have been successful in redistribution process so that everybody gets minimum quality life. If it was expected Rs 60,000 to 70,000 crores for these developments, now an addition of Rs 30,000 crore to this has become the need of the hour in expanding and re-building roads and infrastructure after the floods. The other concern is the damage the floods been done to the traditional industries of the state like Chendamangalam weaving and to Aranmula Mirror. Their living ways were destroyed and it is a concern of how to rebuild their lives as well”. Mr. Shashi Tharoor, Member of Parliament, Lok Sabha, said, “People of the state of Kerala beyond caste, religion, and politics came together during the flood operation. The youngsters did commendable work in spreading the word on getting help both on social media and on-ground. On the UAE aid controversy, I would like to clarify that there are far richer countries than India, which have accepted such aids. Even there is a written policy by the Narendra Modi government in 2016, which states that we can accept the aid offered by a foreign country but may not appeal for it. Kerala needs more financial support and more help in rebuilding the state. Kerala should consider the Bhuj Model of hosting a Rebuild Kerala Conference to bring in money and help in grands, loan or charity in helping the state. During the earthquakes in Bhuj 2001, Gujarat could raise Rs 1.7 billion partly in loan and grand for helping the state. But for that we need a credible assessment and hence I suggest, we seek help from the international agencies like UN in studying the destruction caused and based on it we can arrange conclaves in creating a new Kerala.”.